Since home educating my son I have turned the downstairs room which would have been just a dining room into our play room/learning room. It's not a massive room but is open plan to the staircase and hence feels larger than it actually is. 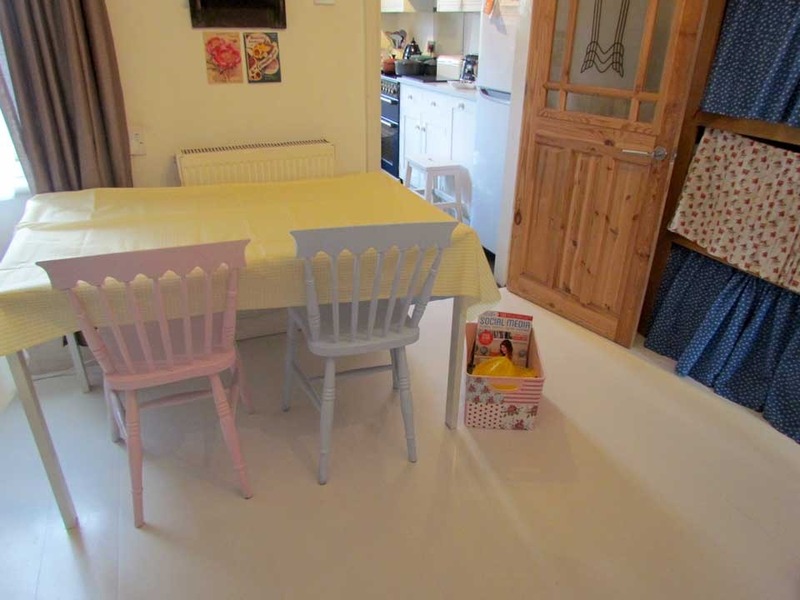 Last year it had a bit of a revamp and I repainted the walls and decided to paint the wooden floor white which for a dark back room has made it so much brighter. Combined with pastel colours it has lifted the space and now we have a blank canvas to making it our perfect learning area for years to come. 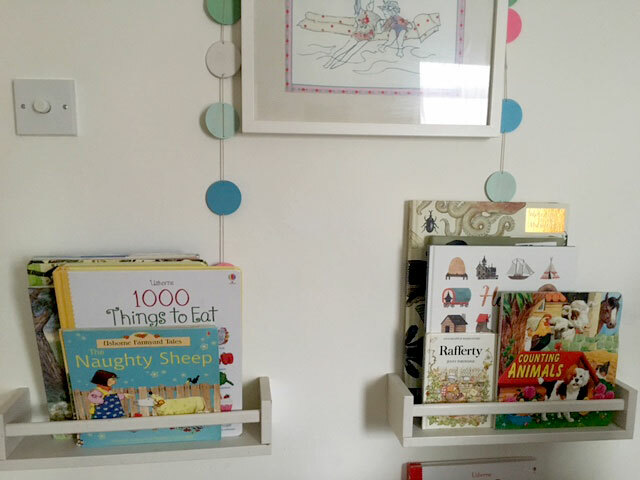 We have lots of books and have a couple of creative ways to store them so they are easily accessible to my son and to me as the one teaching him. Some are on an old church pew that I found in a junk shop and have painted up in powder blue. Our seasonal and topical books are in Ikea spice racks on the wall, such a cheap hack and I think it makes a nice display too. It's great having out books to hand, although this is just a small section of them and I rotate them frequently depending upon what we are learning about. Book caddies are useful too and I particularly love this smiley heart one made by Joni at Lay Baby Lay, very cute and great instead of having a pile of books just lying around. Whether it's for pinning our paintings to, posting reminders of our activities or making a pretty display for the season, an area of the room for a board is essential for a home education space. 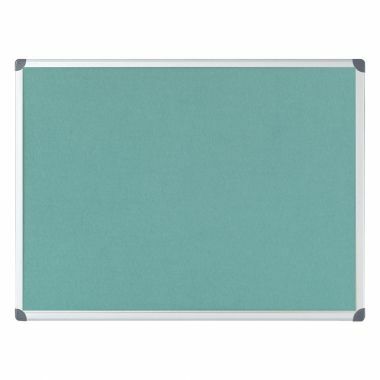 As a bright and colourful feature for a room, rainbow boards from Teacher Boards are a practical solution - from felt notice boards to dry wipe boards in an array of colours. Super cheerful and in lots of sizes for any room. They come complete with the fixing kit and there are useful combination boards of felt and dry wipe available too. When home educating you amass a lot of items - toys, learning activities, puzzles, arts and crafts items and well...it can all get a little messy. Organisation is key and as I've found, I need to know where things are so that I can seize the opportunity and we can learn about letters or numbers or animals and it doesn't take me long to locate what we need. Coloured baskets, plastic tubs and patterned boxes to put our small play bits and pieces into on open shelves can look fun, organised and accessible. Labelling them up yourselves can be a little project for the children to customise themselves. 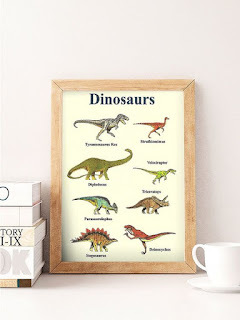 Wall art to inspire us and learn at the same time such as maps or art such as this dinosaur picture fro Etsy brightens to the room and makes it a cheery, child friendly space. 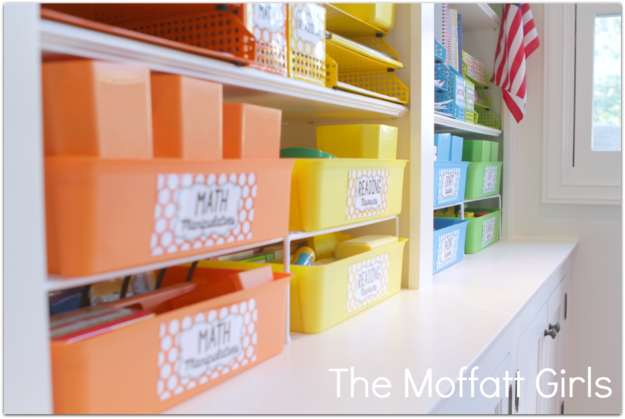 Storage can look decorative too - coloured maths counters in jars and door pockets of coloured crayons for instance. Educational charts can be picked up inexpensively and hence changed as our subjects change, we have one on shapes and numbers and animals of the world. It's your space to tailor for your child and their unique way of learning hence why animals being a huge topic for us are often to be found on our wall art. The next project I'd like to do is create a nook for reading and quiet play and learning. 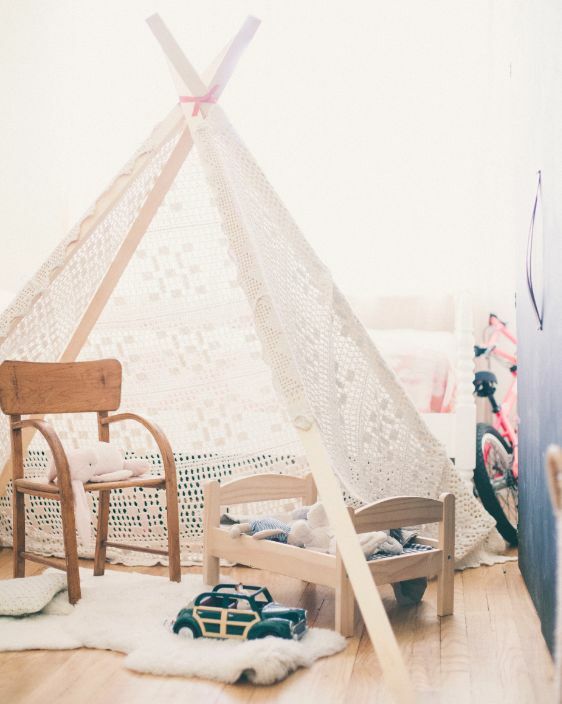 Maybe a fabric wigwam or a section of the room with a fluffy rug and fairy lights as a chill out sensory area with lots of cushions and a basket of calming items or a nature box to explore. 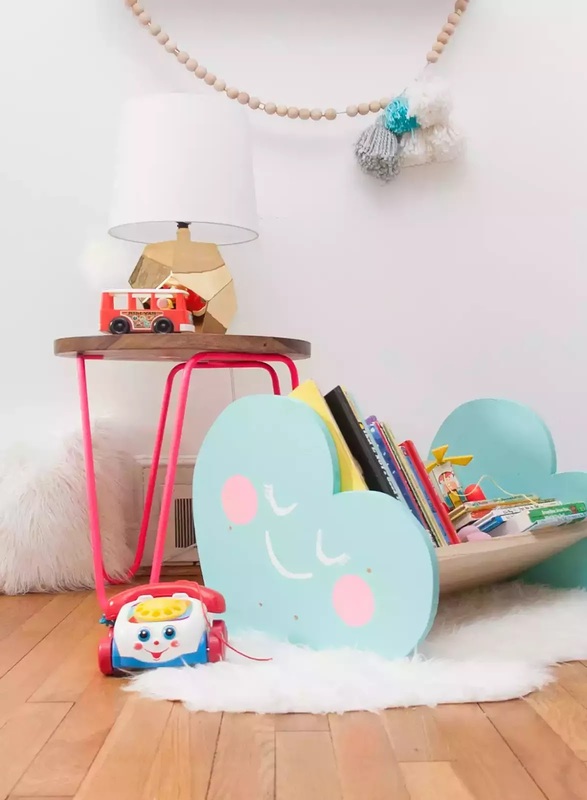 Follow Happy Homebird's board Children's Room on Pinterest.